You remember that pretty yellow kitchen we just finished painting, and the gleaming white ceiling Pat rolled on Sunday? Then yesterday we discovered a suspicious stain under the upstairs bathtub? Well, today the plumber arrived, cut a hole in the wall behind the faucets of the tub/shower, and found NOTHING. He could see no leaks from that vantage. And now we have an opportunity. 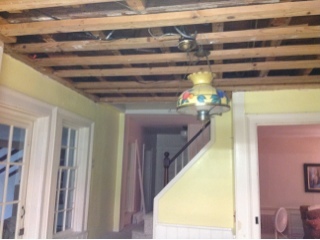 Do we put the sheetrock back up, or leave it down to expose these 200-year-old hand-hewn beams? As we were considering the options, we went to lunch with Tracy and did a little shopping. Ready to leave, we climbed into the Volvo to come home and it would not start. 2 hours later, after getting Pat and Tracy a ride home, I sent Ms. Volvo on a road trip to Cheshire, MA, aboard a wrecker and compliments of AAA. With any luck the Volvo dealer there will be able to figure out why the security system thinks I am stealing my car and refuses to start.